Scenic Detour is a Seattle/Everett based improvisational group that strives for the saucy and the strange. They tell non-linear stories with the protagonist being recast in every scene by a different improviser. Their humor is physical, coarse, and usually not children-appropriate. 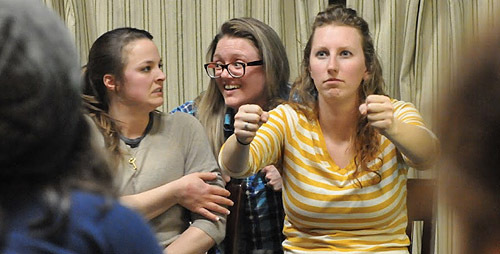 Scenic Detour Improv is a Seattle/Everett based improvisational troupe, regularly experimenting with new long-form shows and playful character work. Players consist of Jet City veterans Britney Barber, Katy Nuttman, and Margaret Erickson. They can be found in historical downtown Everett, Washington performing every 3rd Saturday of the month at Cafe Zippy, located at 1502 Rucker Ave.
Scenic Detour features Britney Barber, Katy Nuttman & Margaret Erickson. This will be their fourth visit to SFIT. Visit Scenic Detour on Facebook!